London (United Kingdom) – November 1, 2018 (travelindex.com) – Almost 170 exhibitors are making their debut at this year’s WTM London 2018 – the event where ideas arrive. They include airlines, movie-set tour providers, adventure operators and sports venues, as well as tourist boards, destination marketing companies, tech innovators and car-hire companies. Among new airlines that are flying in are US-based Air Transat; Indian-based Go Airlines; Middle Eastern carrier Royal Brunei Airlines and Iceland’s national carrier, Icelandair. Book your hotel in London at the WTM Woirld Travel Market 2018 and around the world in 55 countries at best rates available. Pay at the hotel. Book now at HotelWorlds.com! Also over from Iceland is tour company Guide to Iceland, which offers accommodation, packages and tours including Game of Thrones-themed itineraries for fans who want to visit the settings for some of the hit TV show’s most iconic scenes. 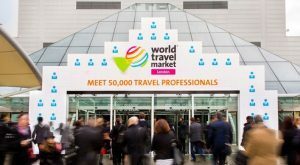 New tourist boards and destination representation bodies at WTM London 2018 include the Armenian Tourism Development Foundation, which is keen to showcase itself as a hotspot for adventure lovers; the National Tourism Office of Djibouti, a mostly French- and Arab-speaking country on the Horn of Africa and Costa del Sol Malaga Tourist Board, which is boosting its profile with its first stand-alone exhibition space in addition to maintaining a presence on the main Spain stand. In the Caribbean section, the British Virgin Islands Tourist Board, is returning to WTM London after a seven-year absence. The collection of 60 unspoiled islands that ‘pack the best of the Caribbean into one convenient destination’, will be updating partners on its recovery progress following devastating damage incurred by Hurricane Irma just over a year ago. Ginny Hawksley, managing consultant for BVI Tourist Board in London said: “We are thrilled to be exhibiting at the WTM London. We feel it is incredibly important to support our trade partners and be present, as well as let the industry know that we are very much open for business and on the road to a full recovery after Hurricane Irma. New regional representatives include Okinawa Convention & Visitors Bureau, representing the Japanese island in the East China Sea, which describes itself as ‘the portal between Japan and the tropics’. Also new is Tamilnadu Tourism Department, representing one of India’s 29 states, Tamil Nadu, famed for its Dravidian-style Hindu temples; beautiful sunrises at Kanyakumari, India’s southernmost tip, and its historically important capital Chennai (formerly known as Madras). Twenty two years after the catastrophic accident at the Chernobyl Nuclear Power Plant in northern Ukraine, tour company CHERNOBYL welcome, which operates packages taking in ‘ultimate experience’ guided tours to the ghost town of Pripyat and surrounding region, is making its debut at WTM London. New exhibitors from the accommodation sector include the Queen Elizabeth 2 hotel in Dubai, which previously sailed the oceans as the iconic flagship of UK cruise line Cunard. Upcoming enhancements to the QE2 hotel, which is now docked permanently at Dubai’s Mina Rashid, include a swimming pool, gym and private beach. There are over 60 new exhibitors from the fast-moving technology sector all exhibiting in Travel Forward, the event highlighting the future of technology in the travel and hospitality industry, including Travel Ledger, an industry-owned and run B2B billing and settlement platform, built using Ethereum Blockchain technology. Similar in concept to IATA’s BSP, Travel Ledger highly automates the travel purchasing and payment process along the entire distribution chain and will replace the current and mostly manual billing, reconciliation and settlement process to make it fast, easy and inexpensive to transact non-airline provided travel services electronically. Another payment method making its debut is consumer-focused Fly Now Pay Later, which describes itself as ‘the hassle-free way to pay for travel’. Last, but not least, WTM London is welcoming a number of new exhibitors from the world of sport, including Wembley National Stadium and Manchester City FC. WTM London, Senior Director, Simon Press, said: “With 170 new exhibitors -covering premier sporting venues, prime-location accommodation, new and established destinations and attractions, transport providers and technology innovators – this year’s WTM London and Travel Forward boasts the greatest collection so far of diverse travel and tourism organisations from across the globe under one roof at ExCeL in London. World Travel Market (WTM) portfolio comprises six leading B2B events across four continents, generating more than $7bn of industry deals.The events are: WTM London, the leading global event for the travel industry, is the must-attend three-day exhibition for the worldwide travel and tourism industry. About 50,000 senior travel industry professionals, government ministers and international media visit ExCeL London every November, generating about £3.1 billion of travel industry contracts.